At this time of the year when the blackberries begin to ripen, I am reminded of what a great fruit this bramble plant provides. The plant itself, being spiny, notorious for suckering and hard to eradicate, has one great virtue. It grows wild wherever there is enough water and produces abundant fruit without cultivation, sprays, pruning or any interference whatsoever by human kind. That’s a wonderful characteristic for a gardener/orchardist/rancher/writer who always has way too much to do, especially in the summer months. The blackberry fruit can only be picked when ripe, unlike stone fruits that color and look luscious while still hard as concrete and devoid of flavor. This pretty much guarantees maximum sweetness, as the berry clings to its center cone unless ready to eat. Picking is admittedly fraught with sharp contacts from the thorns, but we dress appropriately in heavy clothing and wear leather gloves with the ends of the fingers cut off. 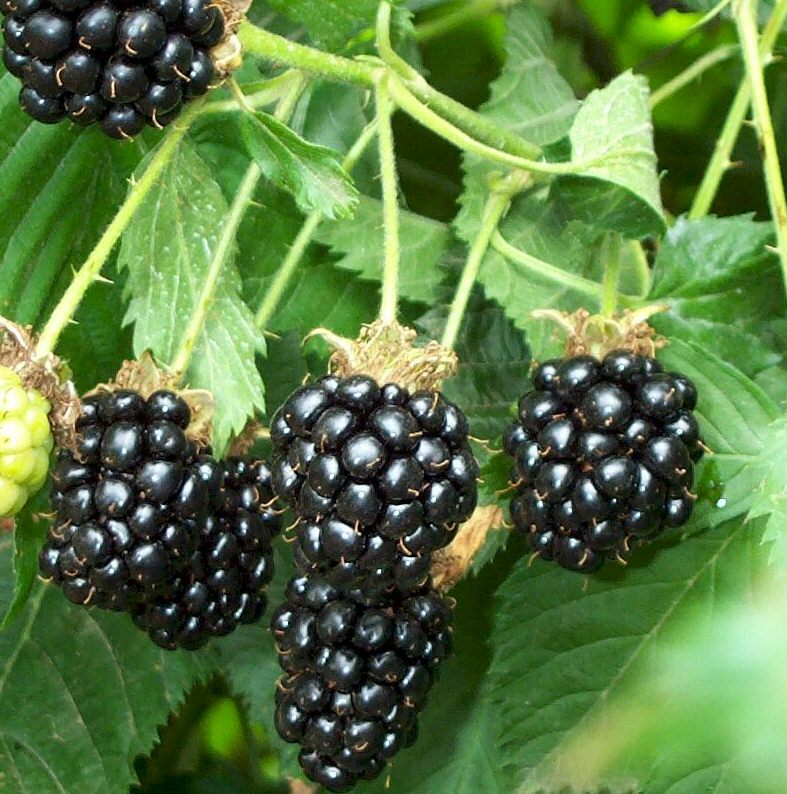 Once picked, blackberries need no preparation beyond a quick rinse and look-over for stones or pieces of stem. They don’t have to be peeled, cored or stripped from the vines, nor do they need the seeds removed. The only other fruit I can think of that’s this easy is the banana, and it still has to be peeled. 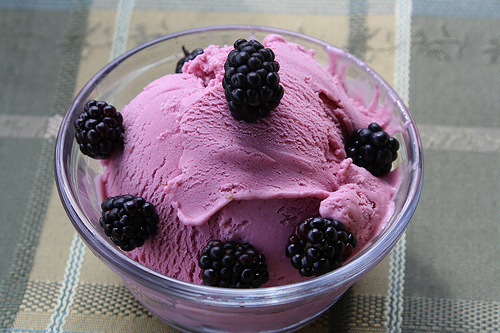 Blackberries can be used in a nearly infinite number of dishes. First, of course, there is the supreme yet simple gustatory pleasure of blackberries in fresh cream. From that point, we diverge into blackberry ice cream, cobbler, blackberry jam cake (see recipe below), smoothies and blackberry yogurt. Blackberries can be juiced, jammed and jellied, added to fruit salads and blackberry pancakes. They freeze well and need no advance preparation such as blanching or treatment to prevent darkening. For the lazy gardener/orchardist/rancher/writer who is also a lazy cook, there’s no fruit to beat the blackberry! Cream butter and sugar, add eggs, then jam. Beat until well mixed. Sift dry ingredients; add alternately with milk, beating until smooth. Bake in 10-inch greased tube pan or 9X13 pan at 350 degrees for 1 hour. This entry was posted in Farms, Food, Health and tagged blackberries, blackberry, cake, fruit, ice cream, jam. Bookmark the permalink. Two of us picked 40 kg (~90 lbs) last year, and didn’t come close to exhausting the ring of berries around our interstream field. We find the rush to pick drains us of the energy to do something creative with them before they mould in the fridge. So we load them into the steam juicer, which basically pasteurizes and seals the re-used gallon jugs we put the juice into. This juice lasts well into winter at room temperature, when we have more time to make jelly. What’s left over after juicing goes through a Roma processor, which extracts the seeds and leaves the pulp, which gets put into measured packages and popped in the freezer. Then we discover it in the dark days of winter and put it in raw goat ice cream, apple crisp, or raw goat yoghurt smoothies. So don’t let inability to deal with a rush of blackberries keep you from picking — and preserving — as many as you possibly can! That’s a great way to take care of lots of berries, Jan. 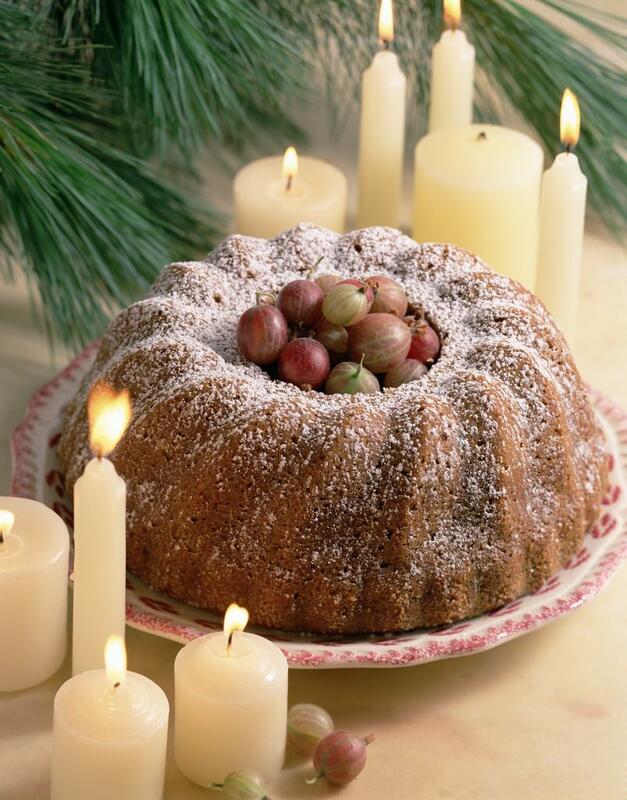 I do something similar — give ’em a quick rinse, toss in the freezer and then make jam around December.